The highest exterior elevator in Europe. It connects a spectacular rock path with the lookout point Hammetschwand on the Bürgenstock plateau overlooking Lake Lucerne. The elevator whisks passengers 153 meters up to the summit of the Hammetschwand in less than one minute and is a major tourists attraction. A glass elevator built onto the side of a huge cliff in the Wulingyuan area. At a height of 1,070 feet (330 m), it is claimed to be the highest and heaviest outdoor elevator in the world. Construction of the elevator began in October 1999, and it was opened to the public by 2002. The Sky Tower is an observation tower in the city of Auckland. The view from the observation level (610 feet in the air) is breathtaking. The ride up to the observation level is by a 40-second ride up in a glass-fronted elevator. The floor is also glass-made so you can look down through the floor for the extra thrill of seeing the ground speed away from you, and come rushing back towards you on the descent. 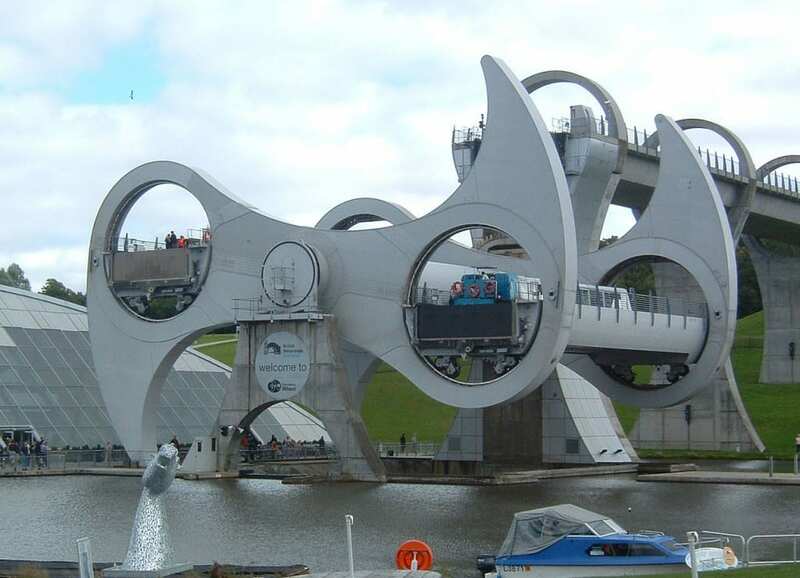 A rotating boat lift that connects the Forth and Clyde Canal with the Union Canal. The difference in height of the two canals at the wheel is 24 meters (79 ft), roughly equivalent to the height of an eight-story building. So basically, you’re riding an elevator while within a boat! The AquaDom in Berlin is a 25 meter tall (82 feet) cylindrical acrylic glass aquarium with a built-in transparent elevator inside of it. A 630-foot (190 m) monument in St. Louis, Missouri. Clad in stainless steel and built in the form of an arch, it is the tallest man-made monument in the United States and the world’s tallest arch. To go to the top of the Arch, there’s a tram in each leg of the arch. Each tram is a chain of eight egg-shaped compartments, each capable of holding five passengers. The trip to the top takes four minutes. To get to the top of Eifel Tower you first have to take a lift from the ground to the first level. This lift is not a regular vertical elevator, but an elevator that runs up the legs of the Eiffel in a diagonal line. Then you switch to a regular elevator that takes you to the top where you can see the wonderful skyline of Paris. Connecting the old and the new part of the city of Salvador, and allowing access to more than 30,000 people a day at a cost of $0.05 for a ride. The ride is 38 seconds long and the elevator reaches a height of 72 meters (236 ft). The double-deck elevators set a new speed record in 2004 with top ascending speeds of 16.83 m (55.22 ft) per second (60.6 km/h, 37.7 mi/h). Taipei 101’s elevators sweep visitors from the fifth floor to the 89th-floor observatory in only 37 seconds.